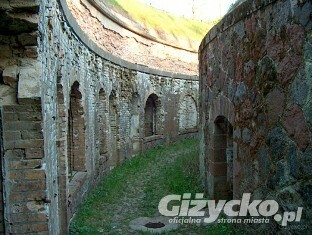 Giżycko’s most interesting monument of exceptional historic value and tourist appeal is the Boyen Fortress. It is a rare example of a 19th century Prussian-school fortification and is one of the best preserved monuments of defensive architecture of the 19th century in <?xml:namespace prefix = st1 ns = "urn:schemas-microsoft-com:office:smarttags" />Poland. The foundation stone for the construction was laid on 4 September 1844. In honour of the services of the contemporary Prussian minister of war general Hermana von Boyen, who promoted the idea of the fortress, on 24 December 1846, the fortress was named “Feste Boyen”. The estate covers an area of nearly 100 hectares. It is in the shape of an irregular hexagram with a courtyard in the centre. The shape is determined by a five-metre 3.3 km long brick-and-stone wall, called Carnot’s Wall, a dry moat and inner and outer embankments. Each of the six corners of the star is a bastion. Three of them are named after the given names of General Boyen, i.e. Leopold, Ludwig and Herman, the others being the features of his coat of arms: Schwert (Sword), Recht (Law) and Licht (Light). The entrance to it is secured by two-element gates with neo-gothic details. The main gate, called The Giżycka Gate, is the most prominent. The water entrance from the side of Lake Niegocin was once secured by The Water Gate, which has been out of use since the railway line was opened and the canal was buried. Inside there was an arsenal, exercise buildings, stables, a blacksmith’s shop, workshops, two granaries and a carrier pigeon station capable of keeping up to 700 pigeons. The year 1855 is officially recognised as the date when the fortress was completed. The Boyen Fortress, which was never conquered, now serves as a summer entertainment centre, where, in the picturesque scenery of the amphitheatre, various concerts and festivals are held, such as the already renowned “Shanties in Giżycko” Sailing and Maritime Song Festival. There is also a youth hostel, a museum, a vintage motorcycle club, a diving club and a radio station. The fortress is best visited with a tour guide. 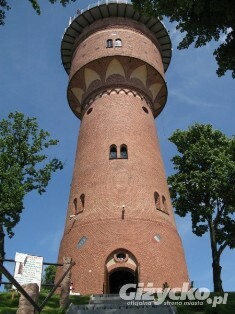 The Teutonic Castle was erected in the first half of the 14th century along the strategic canal which divides the town in two. It was inhabited by the Order’s local official, and after the secularisation of Prussia in 1525 and the establishment of a secular state called The Duchy of Prussia, it was the seat of the starost. In the 17th century, two lower wings (consumed by fire in the 18th century) were added for utility purposes and a low cylindrical tower, which survived until 1945. In 1807, it served as the headquarters for General Dąbrowski and his staff. Until the end of WWII, the castle formed one defensive complex together with the fortress. After the war, the castle served as a hotel. The castle as can be seen today is a four-storey rectangular building. 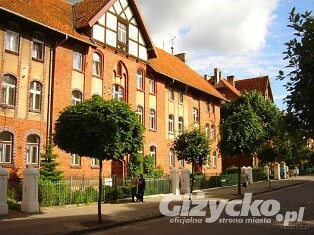 In Giżycko, one can still admire traditional 19th century municipal tenement houses, some of which are situated in Pionierska and Dąbrowskiego Streets. They form a densely built-up row of red-brick terraced houses with neo-gothic decorations. While in Warszawska Street, one should see the mid-19th century building of the present day “Mała Galeria”, the court house dated 1865 and The Social Welfare House (formerly an orphanage) dated 1867. In 1 Maja Street there is a school building dated from 1891 and a former hospital, i.e. the tenement house (with a cross) dated 1897 in Konarskiego Street.